The Fit & Fresh Lunch on the Go makes taking along healthy food easy. The large compartment is big enough to hold a sandwich, salad or last night's leftovers. 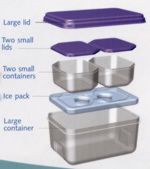 Two smaller compartments with lids are perfect for sides, condiments or for storing cold cuts separately. 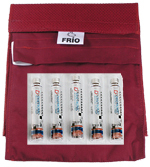 An ice pack divider keeps everything cold for up to 6 hours. 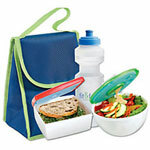 Portion sizes are controlled easily with this attractive lunch case. Great for those who do not have access to a refrigerator to keep their lunch cold. Lunch container measures 5 1/4 in x 7 1/4 in x 4 in. Lunch case is made of clear plastic with lavender lids. All parts are top rack dishwasher safe except for the ice pack. 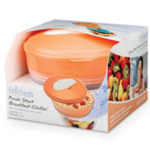 Food can be frozen and microwaved in this versatile lunch box. Great for kids lunches at school. This product was added to our catalog on Saturday 30 July, 2005.